Kevin Folman’s career could have come to a complete halt in the summer of 2015, but the closer’s mentality would not let a season-ending injury dictate the trajectory of his pitching career. According to Fan Graphs, 80 professional baseball players underwent Tommy John Surgery in 2015. Tommy John Surgery, also known as ulnar collateral ligament (UCL) reconstruction, has become a frequent operation performed on professional and youth baseball players across the country over the past decade. The all-too-common set back has struck close to home for North Dakota State players. 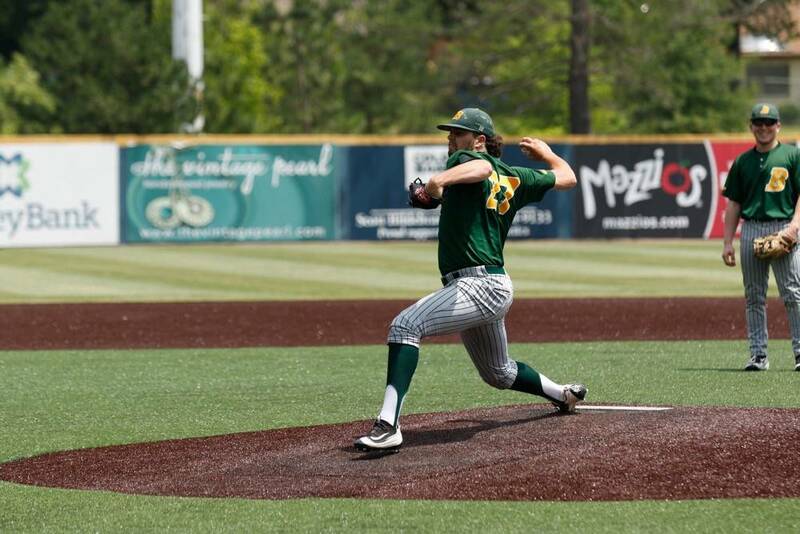 Senior right-handed pitcher Kevin Folman felt a pop on the mound when he was pitching for the Duluth Huskies in the Northwoods League in the summer of 2015. His sixth start of the summer would be his last as the pop was the result of a tear in his UCL, requiring him to undergo the unapologetic trials of Tommy John Surgery. NDSU pitching coach Tyler Oakes has seen this injury numerous times, whether it was to his teammates in college at the University of Minnesota or players he’s coached with the Bison. He said the best-case scenario is the pitcher is back within a year, but in some instances, it can take a full two years for the pitcher to find his rhythm again. Oakes found himself pulling back the reins on Folman, who was determined to return to the pitching rubber. The Hermantown, Minnesota, native had yet to solidify a role with the Bison at the time of his injury. He was a hard-throwing starter in high school, but out of his 18 appearances in college, only two were starts. Oakes and head coach Tod Brown found the best way to get Folman back on the mound was for him to eat an inning at a time while coming out of the bullpen. What started as a way for Folman to gradually recover quickly transformed into a role the junior would take pride and ownership of. In his first season back, the junior threw 26 and two-thirds innings out of the bullpen. He struck out 23 and opponents hit a futile .216 against the full-time closer. Folman shut the door on numerous games and was credited with eight saves. Before last summer’s Major League Baseball Amateur Draft, MLB.com ranked Folman as the best draft prospect in the state of North Dakota. Around a month before Folman’s injury in 2015, he saw his Bison teammate, friend and mentor Jay Flaa get drafted by the Baltimore Orioles in the sixth round of the draft. Flaa was one of the most effective bullpen hurlers in NDSU history. Folman is back to 100 percent from Tommy John. He has three pitches he trusts locating at any time during an at-bat and has a change-up that has a habit of dying before reaching hitters. His arsenal led to his selection for the Northwoods League All-Star game this past summer. Oakes said Folman has exceeded expectations since his return from injury. The pitching coach also notes the impact he’s had on the younger guys on the team. Folman graduated with a math education degree and plans to teach and coach baseball once his playing days are over. But he’s not-so-fast to close the door on his baseball career. Whether it’s in the minors or independent baseball, Folman will be storming out of the bullpen somewhere this summer.